red legs, made him feel some excitement. "I really — I really can't help hoping he will win !" he said, with an apologetic sort of cough. At that moment, the wildest yell of all went up from the dancing, hopping boys. With one last frantic leap the future Earl of Dorin-court had reached the lamp-post at the end of the block and touched it, just two seconds be­fore Billy Williams flung himself at it, panting. " Three cheers for Ceddie Errol! " yelled the little boys. " Hooray for Ceddie Errol! " Mr. Havisham drew his head in at the window of his coupe and leaned back with a dry smile.
" Bravo, Lord Fauntleroy ! " he said. 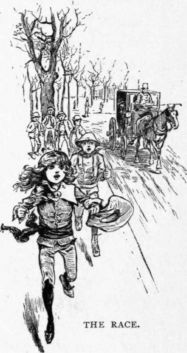 As his carriage stopped before the door of Mrs. Errol's house, the victor and the vanquished were coming toward it, attended by the clamoring crew. Cedric walked by Billy Williams and was speaking to him. His elated little face was very red, his curls clung to his hot, moist forehead, his hands were in his pockets.
" You see," he was saying, evidently with the intention of making defeat easy for his unsuccessful rival, " I guess I won because my legs are a little longer than yours. I guess that was it. You see, I 'm three days older than you, and that gives me a 'vantage. I 'm three days older."